What Can You Do with a Grappling Hook? Michael Hodge of GMAU got himself one of our High Strength Aluminum Bo Staffs and created an awesome high-intensity interval training (HIIT) video. For those of you who don't know, HIIT (also known as high-intensity intermittent exercise) is a form of training your body where you perform extremely intense anaerobic exercises for short periods of time with shorter periods of rest or less intense exercise. This form of exercise allows you to increase your power, speed, strength, and even cardiovascular health. Michael starts with a 3 minute warmup. This is supposed to get the muscles limber and pliable. Then he dives in with workouts like a figure 8 spin and squats. But Michael really utilizes the aluminum bo staff with the one-handed thrusts. Using a two and a half pound staff makes this particular exercise particularly challenging. 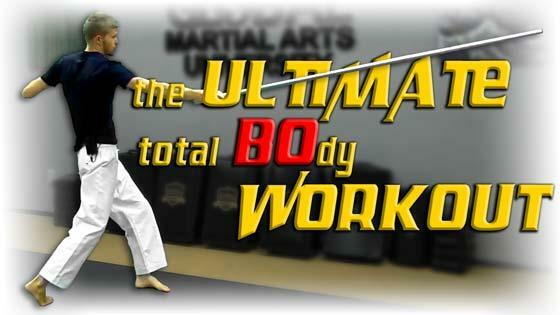 There's a lot more to this exercise-along video, and if you want a good bo staff video that you can do in your own home, click on the video below. Each of the four sets lasts around two minutes long and each exercise within a set is broken down into 20-second intervals. Breaks between sets are 10 seconds. So, you know, it's hard work. Stay hydrated. And be sure to check out Michael and all the other guys at at globalmartialarts.university or follow them on Facebook. And don't forget to follow us on your favorite social media networks. You can even like and subscribe to our YouTube channel to see us post fun new videos. If you haven't already, subscribe to our mailing list to get all kinds of deals and specials. To prevent abuse, all comments are approved by our staff before appearing on this page.